New York: The Dow and S&P 500 advanced for a second day on Tuesday as stronger-than-expected consumer confidence data and hopes for further progress on a solution to Europe’s fiscal mess bolstered sentiment. However, in a sign investors are still nervous about the European debt crisis, defensive sectors such as utilities and consumer staples were among the best performers. The Nasdaq composite index also closed lower. Helping to lift the mood on Wall Street, the Conference Board, an industry group, said its index of consumer confidence jumped to its highest level since July, handily topping economists’ forecasts. Financial shares limited the advance, with the S&P financial index down 0.6%. Shares of Bank of America dropped 3.2% to $5.08, its lowest closing level since March 2009. Bank shares have been battered by worries that the impact of the euro zone crisis could spread through the global financial system and their losses highlight the fragility of any stocks rally until European Union policymakers resolve it once and for all. “There seems to be some movement on the European front, but things certainly haven’t been resolved. Financials are taking a step back, and are kind of keeping a cap on the market as a whole," said Thomas Villalta, portfolio manager for Jones Villalta Asset Management in Austin, Texas. In a positive sign for the euro zone, Italian bond yields fell from session highs. In the auction, Italy’s government sold 7.5 billion euros of three- and 10-year bonds, close to the upper end of its target range. Investors also eyed a meeting of European officials in hopes they will make progress in resolving the region’s debt crisis. The day’s most actively traded stock on the New York Stock Exchange was AMR Corp, even though it was halted 28 times throughout the day. It plunged 84% to 26 cents a share after the company, parent of American Airlines, filed for bankruptcy protection and named a new chairman and chief executive. After the market’s close, Standard & Poor’s reduced its credit ratings on several big banks in the United States and Europe, including JPMorgan Chase & Co and Bank of America. S&P said the actions were the result of a sweeping overhaul of its ratings criteria. The affected banks could see higher funding costs, a fixed income strategist said. 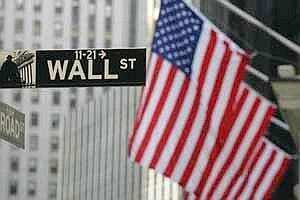 On Monday, US stocks rebounded sharply from seven days of losses, with the S&P closing up nearly 3%. Weakness in some large-cap Internet stocks weighed on the Nasdaq after strong gains in those stocks on Monday. Amazon.com dropped 3% to $183.39. The confidence data followed record Black Friday sales, giving investors hope that the holiday shopping season will be a solid one for retailers. Some 6.73 billion shares changed hands during the day on U.S. exchanges, below the daily average of 7.96 billion shares. Decliners beat advancers on the NYSE by 15 to 14 and on the Nasdaq by about 5 to 3.